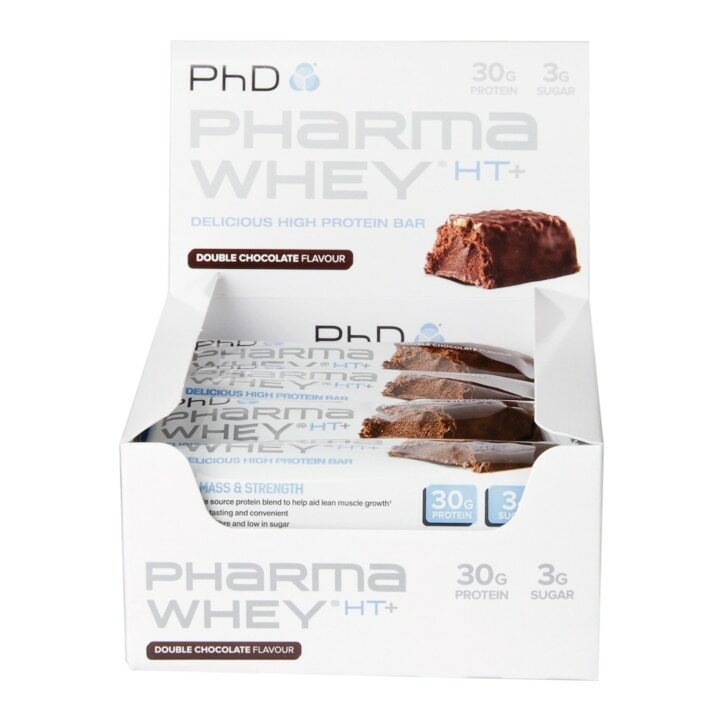 PhD Pharma Whey HT+® is a great tasting, high protein bar that is ideal to use alongside our Pharma Whey HT+® Protein Shake. All athletes require quality protein and Pharma Whey HT+® bars can be used by all types of athletes, at each stage of their sporting development to supplement their training, nutritional goals and objectives. With 30g of protein per delicious bar, derived from a triple-source protein matrix of whey protein, casein and soya protein isolate, Pharma Whey HT+® bar contains only 3.3g of sugar per 75g bar and a whopping 9.3g of dietary fibre. Forget about chocolate covered bars being a guilty pleasure, with PhD they can now be both a pleasure and a high-protein snack for those interested in building muscle and maintaining a serious nutritional plan. With 30g of protein and only 3.3g of sugar, our Pharma Whey HT+® bar really does deliver the next level of convenient nutrition. Each bar is 75g. Consume up to 2 PhD Pharma Whey HT+® bars per day to help support a high protein diet. Protein Blend (Whey Protein Concentrate (Milk), Milk Protein, Soya Protein Isolate, Emulsifier: Soya Lecithin), Milk Chocolate Flavoured Coating (16%) (Sweeteners: Isomalt, Sucralose; Non-Hydrogenated Palm and Palm Kernel Oil, Whey Powder (Milk), Fat Reduced Cocoa Powder, Wheat Flour, Emulsifiers: Soya Lecithin, E476; Flavouring), Hydrolysed Gelatine, Humectant (Glycerol), Fructo-Oligosaccharides, Water, Gelling Agent (Polydextrose), Soya Protein Crisp (5%) (Soya Protein Isolate, Tapioca Starch, Calcium Carbonate, Salt), Fat Reduced Cocoa Powder, Flavourings, Rapeseed Oil, Sweetener (Sucralose), Antioxidant (Mixed Tocopherols). May contain Egg, Peanuts and Nuts. Food supplements should not be used as a substitute for a varied and balanced diet and a healthy lifestyle. Store out of reach of children. Excessive consumption may cause a laxative effect. Store in a cool dry place. PhD Pharma Whey HT+ Bar Double Chocolate is rated 5.0 out of 5 by 2.